Just wanted to share with you some eye candy on this dreary tuesday afternoon. Some of my favorite finds from flickr. 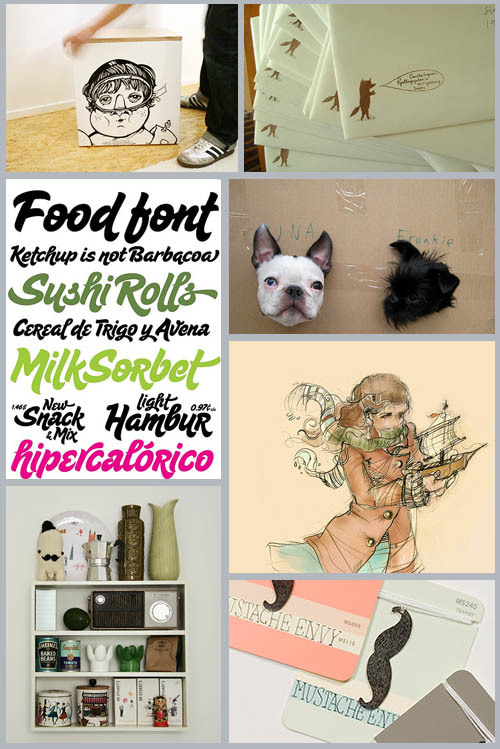 Clockwise from top left: Take a seat from hej frollein, awesome envelopes from Camilla Engman, packaged Una and Frankie from WelcomeToTheDoghouse, in progress illustration from Here On the Road, mustache envy from somethings hiding in here, coolest shelf ever from sandra juto, sugarpie font from Ale Paul. Enjoy! No Responses to "A LITTLE EYE CANDY for a dreary tuesday"